With the AccountMate Accounts Payable module, you can avoid duplicate invoices and late payments, require that invoices recorded in the system be supported by purchase orders and take advantage of early-payment discounts. AccountMate simplifies the payment process by allowing you to post credit card payments or issue checks directly after an invoice is recorded. You can even print checks and generate an ACH file in one sitting. It tracks payments to various types of 1099 vendors and prints the applicable 1099-MISC forms. 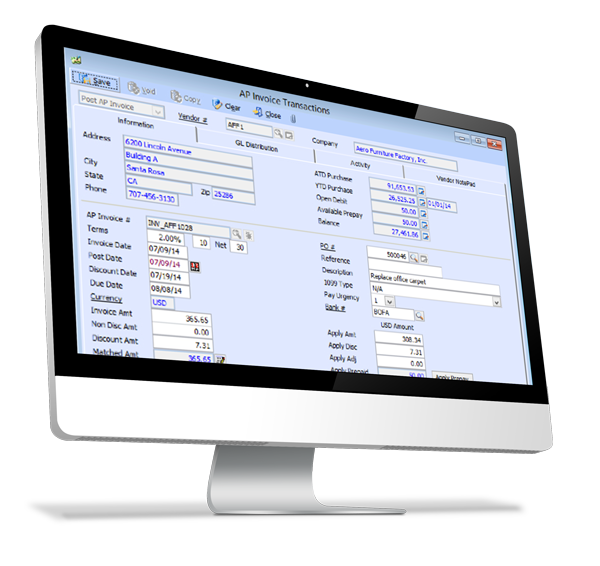 When integrated with AccountMate for SQL’s Purchase Order module, you get a complete purchasing and invoicing system that will enhance your ability to manage your vendor base and cash flow.